Bianca is a Philadelphia native who has been performing since she was 11. She is an alumna of the High School for the Creative and Performing Arts in dance and theater and attended Marymount Manhattan College for theater. Bianca received a BS in Elementary/Special education from Temple University, and an MA as a Reading Specialist from The Lincoln University. She was a member of the Philadanco training company in Philadelphia and performed with the Historical Bushfire theater company in West Philadelphia. 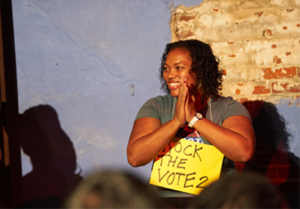 Bianca has been performing Playback Theater since 2005 with Playback for Change and Yes, And Playback theater. Bianca is excited to work with Just Act ensemble for a second year because she is moved by the work and commitment to communities to tackle tough realities. Bianca is a third grade teacher in an inner city title I school, who is married with three beautiful children and is committed to social justice and serving the community at large.